On July 4th of this year I was lucky to be able to walk to Art Hill from a friend’s Central West End apartment. The east side of Forest Park is beautifully designed with trails and pedestrian bridges, which wind among groves of trees and fields of flowers. Arguably the most picturesque part of these trails is the Victorian Bridge, which was built in 1885 as part of a new streetcar entrance to Forest Park. The bridge was restored in 1994 by the Forest Park Forever Women’s Committee. The bridge’s installation signified a transition for Forest Park, from a place accessible only to affluent residents to one enjoyed by all city residents. Today the Victorian Bridge serves as a reminder of the important role streetcars served in St. Louis history. Forest Park’s official opening day was June 24, 1876, but the effort to create the park took more than a decade of planning. Forest Park was originally proposed as St. Louis’ own Central Park, a way of keeping up with other large cities, like New York, Brooklyn, Baltimore, and Chicago. Other major cities already had or were working on creating large public parks. But St. Louis’ poor and middle class residents were skeptical of the motivations for creating a large park so far (four miles) from the most densely inhabited parts of the city—only rich residents with horse-drawn carriages would have been able to make regular use of such a park. Some residents thought (mostly correctly) that the plan was nothing more than a get-rich-quick scheme by some local landowners, notably William M. McPherson, namesake of McPherson Court in the Skinker-Debalievere neighborhood. Others said that such a large project should not be started until after the Civil War was finished. Voters rejected the Central Park proposal in 1864. In 1871 another plan was proposed, but the proposed 3,000-acre park would have required financing by a special tax on neighboring properties. Needless to say, some prominent local landowners, notably Henry Shaw, Thomas Skinker, Charles P. Chouteau, Robert Forsyth, and Charles Cabanne, were less than thrilled with the proposal. Under state law at the time, the park could only be established by the state legislature, which adjourned without making a decision on the matter. Another proposal came the following year, which was partly successful in establishing Forest Park. But wealthy landowners took the legislation to court. During the time the courts were making their decisions, the Forest Park supporters bought up a large piece of land from Thomas Skinker and arranged for the St. Louis County Railroad Company to build a narrow-guage track to the park, thereby easing concerns that it would only be accessible to the elite. But, and it’s a big but, when the Missouri Supreme Court decided the legislature-approved plan was unconstitutional, the land purchase from Skinker was declared invalid, and the organizers’ real estate schemes quickly dissolved. Finally in 1874 the state legislature approved three separate acts establishing Carondelet Park in South St. Louis, O’Fallon Park in North St. Louis, and Forest Park in the middle. The stated purpose of the aptly-named Forest Park Act was to establish a central public park for the people of St. Louis County, including the City of St. Louis. Although, after the divorce of city from county in 1876, Forest Park would become one of sixteen parks located within the St. Louis City limits. Forest Park quickly became a celebrated semi-rural retreat for city residents. Fashionable neighborhoods began to pop up around the park’s perimeter. Wealthy residents accessed the park by carriage, even though the main road to Forest Park, Lindell Boulevard, was still just a dirt road. It was also possible to rent carriages for a few dollars, but that would have been beyond the means of poor residents. Other residents used the Wabash Railroad, which took passengers from Downtown to Forest Park for fifteen cents. 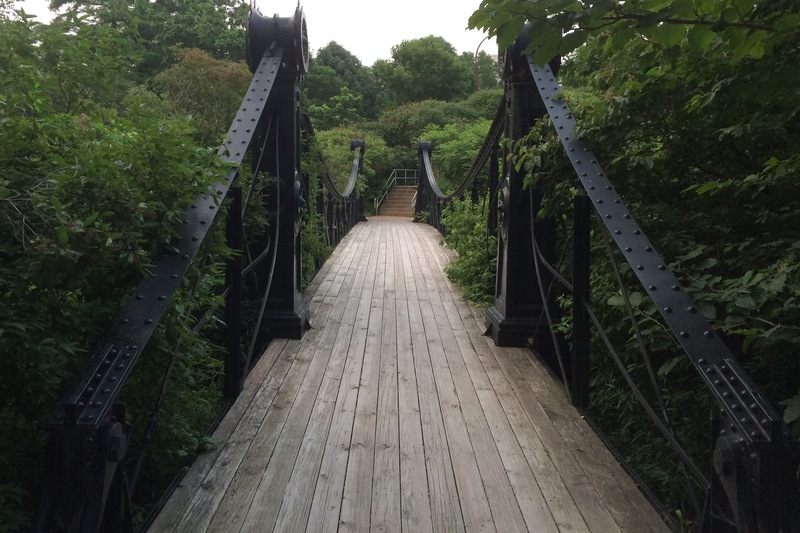 In 1885 a streetcar line opened that provided direct access to the park; enter the Victorian Bridge. This first streetcar line was horse-powered. The streetcars, which ran twice an hour, would have only cost ten cents for a roundtrip fare—one third the cost of using the railroad line. Forest Park, already popular, became a top weekend destination for thousands of city residents. 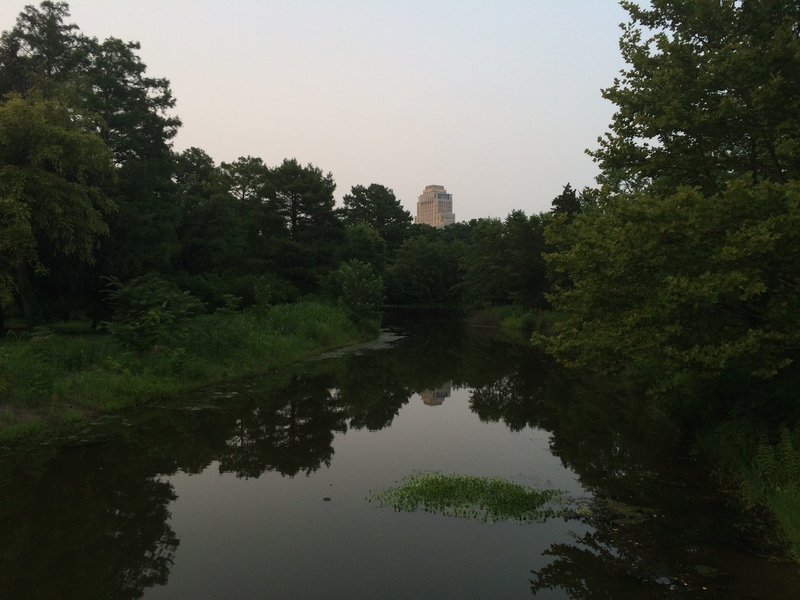 Forest Park was especially popular on hot summer days, when residents were eager to escape their hot brick-built environs—Forest Park offered not only acres of shade trees, but also the refreshing waters of the River Des Peres and the Cabanne Spring. In the 1890s the city required that all new streetcar companies building lines to the park also build shelters for waiting passengers to take refuge from the elements. Eames and Young designed two such shelters, which cost the streetcar companies more than $25,000 a piece and immediately became municipal property. The streetcar companies were not making a bad investment—by 1896, the seven streetcar lines (the Olive Street, the Citizens’, and the Peoples’ lines were cable cars, while the Union Depot, the Lindell, the Forest Park, and the Laclede lines were electric streetcars) serving Forest Park carried over two million passengers a year. A lot of the material for this post was taken from a really great book by Caroline Loughlin and Catherine Anderson called Forest Park. It’s a great read for anyone who likes St. Louis history. I’ll probably be checking it out at the St. Louis Public Library for future posts. ← Welcome to St. Louis!